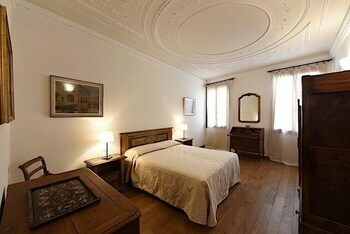 With a stay at Le Due Corone in Venice (San Marco), you'll be steps from St. Mark's Basilica and St Mark's Campanile. With a stay at Romanda in Levico Terme, you'll be a 1-minute walk from Valsugana and 7 minutes by foot from Terme di Levico. Self parking (subject to charges) is available onsite. When you stay at Agriturismo Casa de Bertoldi in Belluno, you'll be near ski lifts and 7 minutes by car from Belluno Pool. Free self parking is available onsite. With a stay at Accogliente Dimora in Putignano, you'll be within a 10-minute drive of Castellana Caves and Carnival of Putignano. Free self parking is available onsite. With a stay at Aggravi Hotel in Chianciano Terme, you'll be within a 5-minute walk of Val di Chiana and Chianciano Art Museum. Featured amenities include multilingual staff and an elevator (lift).